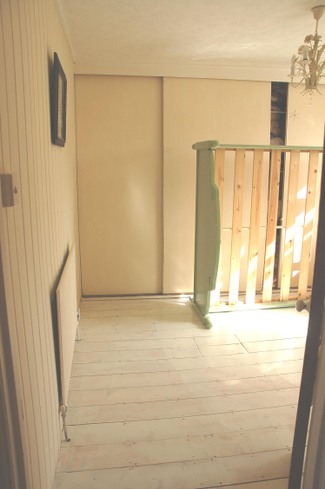 I can't quite believe that it has been so long since I have last posted - I hope you will forgive me because the time to paint the floorboards has arrived! It has been a week of sanding, sleeping where we can, painting and dust! Have I mentioned the word stress? No, well take it from me we have seemed to lurch from one thing to the other. It started last weekend with the hiring of an industrial sander and edger. The last words the hireman said to me when I went to pick up the machines was, "Good luck, you're going to need it!" It took hours to cover everything and empty the rooms. We were going quite well until I heard the light fitting fall down in the hall ..Anth then said calmly that he had had an accident...I went upstairs to find that he had sucked up a large dust sheet into the drum of the sander which then had wrapped around so much that it was completely jammed and unable to move at all. Lucy then came to tell me that the telephone wasn't working and that meant no internet too, plus Justine was in labour and I wanted to be contactable....Urghhh!! To cut (huh!) a long story short..it took 90 minutes and my best sewing scissors to cut and cut through the dust sheet..terrified that we would have to pay a few hundred pounds to replace the machine..finally I cut it free and we were able to carry on. I can't tell you the relief -- even now a week later I still feel traumatized by that! The telephone needed a new cable which I replaced but we have so many extensions it took ages trying to find the right one. The dust was not as bad as I thought it was going to be but when I took the machines back on Monday morning I had to agree that I was glad to see the back of them but so grateful I wasn't taking back a sander wrapped in a dust sheet! So, now starts the painting part. I have painted the dresser in the same green as it was before but this time in a gloss finish. Yesterday I started the floor in our bedroom. As I put the first strokes of the white floor paint on the floorboards the white was suddenly streaked with a yellow colour - it looked just like someone had done a wee in the snow!! I just didn't know what to do so rang the paint company and they told me that because we had left small traces of wood stain still on the boards (I thought it would be ok as we were painting them after all) it probably had creosote in it and that was why it was turning yellow. We had sanded the entire house, apart from 2 rooms, and the only solution was to sand again and this time take every last bit off. I was so upset to say the least. So yesterday I found myself at the hire man's shop and the only thing available was a small belt sander. This stupid machine kept slipping and making the sand paper move out of position every few seconds. In the end we have just sanded by hand and if the paint turns yellow we found that we just do 2 coats. Here is our bedroom awaiting a second coat which I will do next. I think it looks absolutely wonderful..I so love the painted floor thing and am so excited that it finally looks like it will be ok. Sorry this has been such a long post, devoid of loveliness -- but wait. What's that? Yes, I did do some sewing before this sanding milarky and I made a peg bag for my clothes pegs. 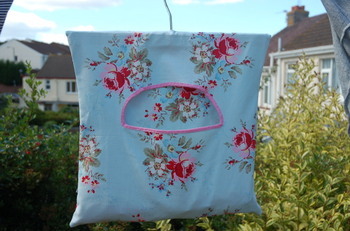 I had seen a lovely Green Gate peg bag but wasn't going to spend £15 so with a £5 tea towel I made a similar one. What do you think?